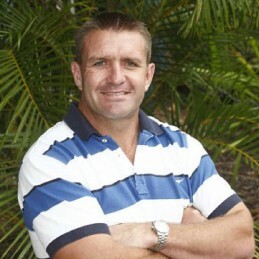 Shane Webcke finished his Rugby League career with a fairytale ending after the Brisbane Broncos won the 2006 Grand Final. On that night he retired from professional football being named as one of the very best in the business. He retired after 25 NRL Finals appearances, four Grand Finals and four Premiership wins. The Broncos leading big man who started his football career playing under 8s as a five-year-old at Clifton, has dominated all comers as arguably rugby league’s leading prop forward. With 254 matches for the Broncos, 20 Tests for Australia and 21 State of Origin appearances for Queensland, Shane Webcke will list the 2006 Grand Final win as his most memorable match. Webcke is the consummate team man. He realises better than anyone that there is no easy answer, no easy way to achieve success. Webcke works hard for everything he achieves. He is the cornerstone that the Broncos build their entire team ethos around. Someone who thrives on a challenge, Shane is one player coach Wayne Bennett and the team knew they could rely on when the going got tough. Shane has been awarded The Broncos Player of the Year (for a second time), and the Player’s Player Award. In April 2005 Shane announced his retirement from representative football, so he could continue his career with the Brisbane Broncos Club. He was able to finish this amazing career in the 2006 Grand Final – every footballer’s dream come true. Shane will now continue his career in media roles and corporate speaking. In October 2006 Shane releases his book “Warhorse”. His memoirs in the book are both powerful and thought-provoking as he talks about his life and football.